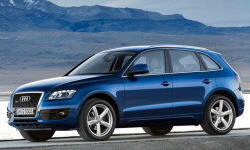 Why the 2009 Audi Q5? Smooth and efficient, works well with transmission, especially at moderate speeds, although with 2.0 TDI transmission is a bit hesitant to downshift when overtaking at high speed and uphill. High quality, well built, no squeaks and rattles after one year of ownership. Why Not the 2009 Audi Q5? Suspension is on the firm side. Great feel and response on smooth roads and gravel, but less comfortable on imperfect urban roads, where you have to ride slowly and do not want to "feel the road" so much.